As we meet Jesus at his baptism, I want to consider this as a sacrifice. Sacrifice means to make holy. Today we return to Luke’s account of the origins and life of Jesus. Personally, I have appreciated this season’s sequential readings through Luke’s Gospel more than, I think, I ever have before. They have allowed me to focus on the care that Luke when he built up the story. To tell the truth, last week’s Epiphany detour into Matthew’s Gospel was an intrusion for me. It interrupted Luke, while it failed to include Matthew’s poignant tale of the Holy Family’s time as refugees in Egypt. That will have to wait till next year, when we will read from Matthew. Most scholars believe that Luke used Mark’s Gospel as a template for his own narrative about the life and teachings of Jesus. Typically, Luke added some details to add colour to Mark’s narrative. Thus, Luke tells us that the events took place in the 15th year of Tiberius’ reign. He amplifies John’s call to repentance (You brood of vipers, etc), as also does Matthew. Luke also gives much more detail about what repentance meant for the people John preached to. Tax collectors must not rake in more money than the amount of the taxes. Soldiers must not use threats and false accusations to extort money in the form of bribes. The big difference between Luke and Mark is that Mark showed no interest in Jesus’ origins or early life. Mark’s Jesus ‘strides onto the stage’ after the proclamation of his coming by John the Baptist. The word ‘sacrifice’ came into the English language in the 13th century from the Latin word sacrificium. That word combines the elements sacri- (from ‘sacer’ meaning holy) with -fic- (from the verb ‘facere’, to make or do). Therefore, sacrifice means to make holy. It does not necessarily have anything to do with killing. However, killing is the context of the animal sacrifices that the ancient world’s temples carried out. Both Jewish and pagan priests made ordinary animals holy by saying prayers as they killed them. That made the meat holy, and acceptable for the priest to offer it to the temple god. Grace before meals is the same concept. We give thanks for the animals and plants that we sacrificed – in the sense of killing – to nourish our bodies. By blessing the food, we make it holy. In a similar way to what happened in ancient temples, we make a sacrificial offering of the bread and wine at Communion. We say special prayers to sacrifice (make holy) ordinary bread and wine. Therefore we must then treat the consecrated bread and wine with respect. We do not throw any leftovers in the garbage or down the drain. But notice: ordinary bread and wine are not innately holy. Nor were the animals in the sacrifices of ancient temples. We make them holy by our actions. Nevertheless, the word sacrifice has become inextricably bound up with death, especially the deaths of soldiers killed in wartime. Prior to WW I, soldiers merely ‘died’ in battle. The soldiers who died fighting for or against Napoleon were just indentured pawns who had to fight for their king or emperor. There were no war memorials. In the 20th century, the soldier’s role changed. World Wars I and II gave those who perished a noble status; they sacrificed themselves for a greater cause. Therefore the pointless deaths of Canadian soldiers at the Somme became sacrifices. In that sense they did not just die; they became holy. The soldier fought for a worthy cause such as the German Fatherland, La France, or the British Empire; later, to save the world from Nazism or Communism. 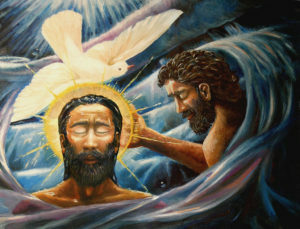 Those words take us back directly to the Baptism of Jesus. The voice from heaven said, “You are my Son, the Beloved, with you I am well pleased.” God attested to Jesus’ holiness, just as Gabriel, the shepherds, Simeon, and Anna had done previously. All of them had made Jesus holy — a living sacrifice. I have belaboured this point for two reasons. 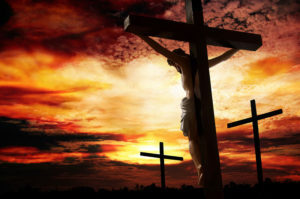 First, I want to dispel the negative perception of many Christians about the word sacrifice. As I have stated, it does not have to imply death. It simply means “to make holy.’ Second, I would like everyone here to see themselves in the same way that God saw Jesus at his baptism – holy; a living sacrifice. Jesus’ mission of preaching and teaching was possible because God had affirmed him as holy – a living sacrifice. That is why we will reaffirm our own baptismal covenant this morning. It is not so that we can re-enact what happened two thousand years ago at the River Jordan. It is instead to reconfirm that we are God’s people living and working in our ordinary, secular world. Call it evangelism; call it mission. Those are just fancy words for doing our best to be the face of Christ to the people we meet. Our baptismal covenant tells us how to do it. Continue to gather together as a parish. Respect other people, no matter who they are. Care for God’s Creation. Then each of us will be a living sacrifice – people made holy.